The recipe itself, while it is an all day endeavor, is not labor intensive – it involves lots of rising time with intermittent spurts of active working of the dough. I made the bread last Saturday and had to arrange all of my errands and outings around the various stages of the recipe. While the bread was baking I was simultaneously congratulating myself for completing my first Daring Bakers challenge, hoping that my loaves would come out looking like loaves, and deciding that I would most definitely not be again making what I was affectionately calling “all day bread”. After I pulled my two loaves out of the oven, I defied the part of the recipe that dictated a 3-4 hour wait time before breaking bread. I immediately served one loaf for dinner that night, but I let the other loaf rest for the required amount of time. Both of them were delicious. Incredible, in fact. Dan swooned over it like I had served him the greatest thing since sliced bread. (OK, OK! I know. I KNOW. Please stop throwing rotten tomatoes my way …) Uh-oh. Maybe I shouldn’t have let him have at the bread? Because now I feel obligated to not deprive him of what he has proclaimed to be the most amazing bread he has ever had. And believe me – this man loves him some bread. He knows his stuff. The original recipe, in all of its glory, includes many different variations for how to make the bread (by Kitchen Aid stand up mixer or by hand) and how to shape the bread. I kneaded by hand and made two medium sized loaves, so those are the parts of the recipe that I will post below. Additionally the originally recipe called for the bread to be baked in canvas. I did not have any canvas so I baked my loaves freeform on a baking sheet and crossed my fingers. Happily, my loaves came out very pretty and loaf-like. Stir the yeast in the 1/3 cup warm water and let liquefy completely while measuring flour into mixing bowl. When yeast has liquefied, pour it into the flour along with the salt and the rest of the water. Stir and cut the liquids into the flour with a rubber spatula, pressing firmly to form a dough and making sure that all the bits of flour and unmassed pieces are gathered in. Turn dough out onto kneading surface, scraping bowl clean. Dough will be soft and sticky. Depending the humidity and temperature of your kitchen and the type of AP flour your use, you may need to add additional flour or water to the dough. To decide if this is necessary, we recommend stopping during the mixing process and push at your dough ball. If the dough is super sticky, add additional flour one handful at a time until the dough is slightly sticky and tacky but not dry. (Note: I needed to add extra flour) If the dough is dry and feels hard, add 1 Tbsp of water a time until the dough is soft and slightly sticky. Turn dough out onto kneading surface, scraping bowl clean. Dough will be soft and sticky. Let the dough rest for 2 – 3 minutes while you wash and dry the bowl. Start kneading by lifting the near edge of the dough, using a pastry scraper or stiff wide spatula to help you if necessary, and flipping the dough over onto itself. Scrape dough off the surface and slap it down; lift edge and flip it over again, repeating the movement rapidly. In 2 -3 minutes the dough should have enough body so that you can give it a quick forward push with the heel of your hand as you flip it over. Continue to knead rapidly and vigorously in this way. If the dough remains too sticky, knead in a sprinkling of flour. The whole kneading process will take 5 – 10 minutes, depending on how expert you become. Shortly after this point, the dough should have developed enough elasticity so it draws back into shape when pushed, indicating the gluten molecules have united and are under tension like a thin web of rubber; the dough should also begin to clean itself off the kneading surface, although it will stick to your fingers if you hold a pinch of dough for more than a second or two. You now have approximately 3 cups of dough that is to rise to 3 1/2 times its original volume, or to about 10 1/2 cups. Wash and fill the mixing bowl with 10 1/2 cups of tepid water (70 – 80 degrees) and make a mark to indicate that level on the outside of the bowl. Note, that the bowl should have fairly upright sides; if they are too outward slanting, the dough will have difficulty in rising. Pour out the water, dry the bowl, and place the dough in it. Very lightly grease the bowl with butter or kitchen spray as well to prevent the risen dough from sticking to the bowl. Lightly flour the palms of your hands and flatten the dough firmly but not too roughly into a circle, deflating any gas bubbles by pinching them. Lift a corner of the near side and flip it down on the far side. Do the same with the left side, then the right side. Finally, lift the near side and tuck it just under the edge of the far side. The mass of dough will look like a rounded cushion. Slip the sides of your hands under the dough and return it to the bowl. Cover and let rise again, this time to not quite triple, but again until it is dome shaped and light and spongy when touched. You may need to lightly re-grease your bowl and plastic wrap for the second rise to prevent sticking. Place the dough on a lightly floured surface. Lift the left side of the dough with the side of your left hand and bring it down almost to the right side. Scoop up the right side and push it back almost to the left side. Turn the dough a quarter turn clockwise and repeat the movement 8 – 10 times. The movement gradually smooths the bottom of the dough and establishes the necessary surface tension; think of the surface of the dough as if it were a fine sheet of rubber you were stretching in every direction. Turn the dough smooth side up and begin rotating it between the palms of your hands, tucking a bit of the dough under the ball as you rotate it. In a dozen turns you should have a neatly shaped ball with a little pucker of dough, le cle, underneath where all the edges have joined together. Place the dough pucker side up on a flour-rubbed tray or baking sheet; seal the pucker by pinching with your fingers. Flour lightly, cover loosely and let rise to almost triple its size. After turning upside down on the baking sheet, slash with either a long central slash, two long central slashes that cross at right angles, or a semi-circular slash around half the circumference. The covered dough is now to rise until almost triple in volume; look carefully at its pre-risen size so that you will be able to judge correctly. It will be light and swollen when risen, but will still feel a little springy when pressed. It is important that the final rise take place where it is dry; if your kitchen is damp, hot, and steamy, let the bread rise in another room or dough will stick to the canvas and you will have difficulty getting it off and onto another baking sheet. It will turn into bread in the oven whatever happens, but you will have an easier time and a better loaf if you aim for ideal conditions. Turn the loaves upside down on the baking sheet. The reason for this reversal is that the present top of the dough has crusted over during its rise; the smooth, soft underside should be uppermost in the oven so that the dough can expand and allow the loaf its final puff of volume. 9: Slashing top of the dough – la coupe. 10: Baking – about 25 minutes; oven preheated to 450 degrees (230 degrees C). 11: Cooling – 2 to 3 hours. If you do not let the French bread cool, the bread will be doughy and the crust will be soft. If you want to have warm French bread, re-heat the bread after it has cooled in a 400 degree oven, uncovered and directly on the oven rack for 10 – 12 minutes. with basil and mint, and sprinkled with salt and pepper. Delicious loaf-o-plenty! Some of the finest bread I have ever consumed. Without a doubt the best French bread I’ve ever eaten. Congratulations on completing your first DB challenge Gail! Nice looking bread. I am not so sure that I could be convinced by anyone to make it for them again, unless it is their birthday! Your bread looks great! congratulations on a successful first challenge! we made bread from scratch once. It took about 7 hours total, and was quite good, but it made us realize that bread (along with pasta) falls into one of those foods that we we quite happy to either buy or sit back and watch others make. Props to you for taking on this endeavor!!! Heres to many more baking feats to come!!!! Great job! It is so satisfying to bake bread and truly enjoy it (or have others enjoy it!). Welcome to the Daring Bakers! 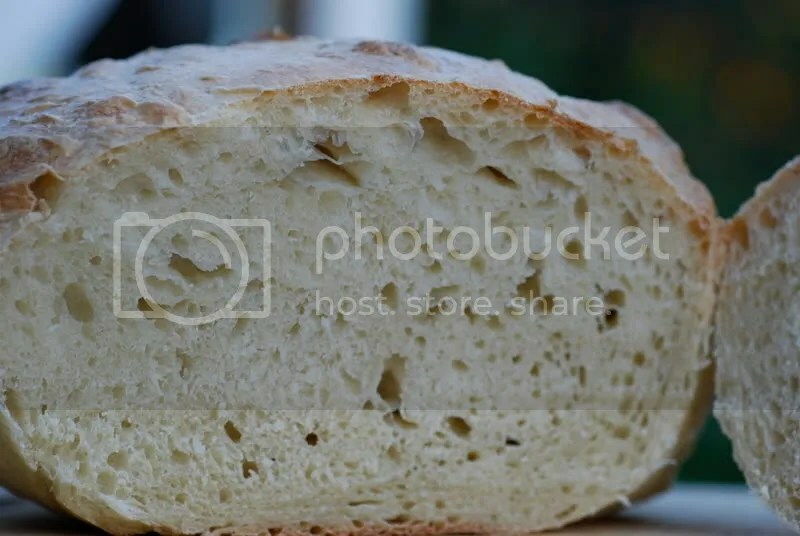 Actually you don’t bake the bread in the canvas. You just use the canvas as support of the baguettes and batards while they rise. You did the correct way of boule. Thanks for baking with Sara and I this month. Your bread looks wonderful. 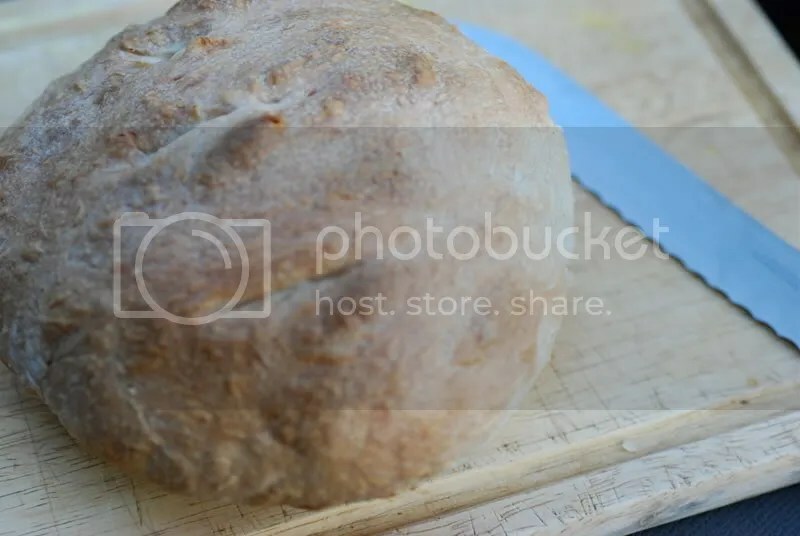 That loaf looks so rustic and appealing. And whoa! The charred tomatoes look simply fantastic. So fresh and delicious! Your bread turned out beautifully. I love the fresh tomatoes and basil…it looks so yummy. Well done on your first challenge – your bread looks great. 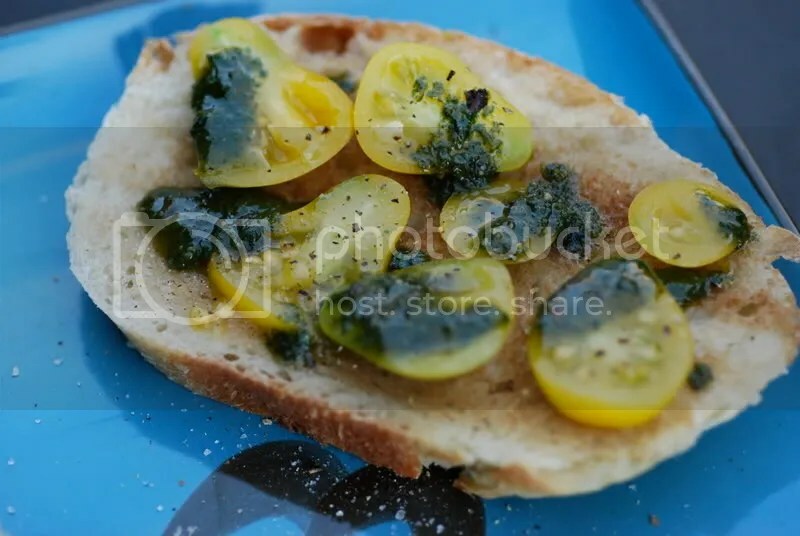 I am very envious of your home grown tomatoes they look like sunshine on a slice. that’s high praise from dan! great job! So funny! I thought the same thing about my first challenge last April with the Gateau St. Honore. Oh, my did I bomb that. But look at your bread. Gorgeous. And it was definitely delicious like you said. Nice Job! Where do you live that you have garden tomatoes!?! Your bread looks great, and I hope you feel welcome in the Daring Bakers! Welcome to the DB community. I felt the same way you did when I joined last month and saw the challenge. Congratulations, your bread looks real nice. Aloha, and thank you all for your wonderful comments! I’ve been having fun check out everyone’s blogs, those of you who are new to the Outpost. I certainly feel welcomed into the DB community.